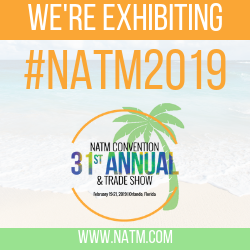 Let your customers and prospective customers know you will be exhibiting at the #NATM2019 Convention & Trade Show. Place your company name in front of attendees long before they enter the Coronado Springs' Exhibit Hall. The earlier you start, the more successful you’ll be at driving your target audience to your booth. Promote your participation in this "must attend" event on your company's website, calendars, social media accounts, etc. with the Exhibitor Marketing Kit. Download the following sample documents and use them to start your marketing campaign. All #NATM2019 Exhibitors in good standing are encouraged to use the official #NATM2019 Convention & Trade show logo in your various marketing materials related to the convention. All logo policies must be met. Not seeing a banner ad that will fit your company's needs? Contact Marketing Coordinator Savana Morrison. Start your pre-show outreach early to draw in the right customers to your booth by sharing event information on your company's social media platforms. Join the online discussion, prior to, during and after #NATM2019 by posting about it on Facebook, Twitter, Instagram or LinkedIn by tagging your posts with the official Convention & Trade Show hashtag: #NATM2019. The #NATM2019 Convention & Trade Show is the ideal forum to reach hundreds of trailer manufacturers and increase brand awareness, advertise your latest products and services, and drive sales. Maximize your company's presence by taking advantage of the numerous sponsorship opportunities. Reach your target audience year-round with NATM's various advertising opportunities. NATM offers a mix of both digital and print advertising opportunities designed to help your company gain awareness on the communication platforms where your clients and buyers are spending their time. Being a #NATM2019 Exhibitor gives you exclusive access to our NATM Convention & Trade Show Attendee list. Wow potential customer by sending out a personalized invitation to your company's booth long before they even step foot on the show floor.